Stand-alone set of the nine double-stranded DNA standards provided with the AccuBlue® Broad Range dsDNA Quantitation Kit (31007). Calf thymus dsDNA in 10 mM Tris pH 7.5, 1 mM EDTA, 2 mM sodium azide at 0, 2, 6.25, 12.5, 25, 50, 100, 150, and 200 ng/uL, 0.5 mL each. AccuBlue® High Sensitivity is a non-mutagenic fluorescent dsDNA quantitation assay for fluorescence microplate reader. 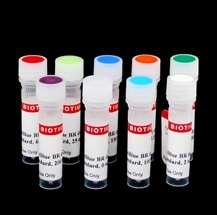 The kit offers sensitive and selective detection of purified dsDNA samples with excellent linearity.